Anarkik3D’s ‘3D Consequences’ – update 6th April 2014: Ann Marie Shillito attended both openings of the ‘Wear IT’ exhibition at StudioFusion Gallery, London,which went on until 7th June, ‘Wear IT’ was an exhibition of 3D printed jewellery and Anarkik3D‘s ‘3D Consequences’ collaborative project. The results of the 3D modelling by 4 Scottish connected designer makers had been 3D printed in either polyamide (sponsored by Sculpteo) or paper (sponsored by ITEC-3D/Mcor) and all is on display. The 4 jewellers in ‘3D Consequences’ were Farah Bandookwala, Elizabeth Armour, Lucy Robertson and ANn Marie Shillito! StudioFusion appropriately also stock my book ‘Digital Crafts’ and I was signing copies at the opening. 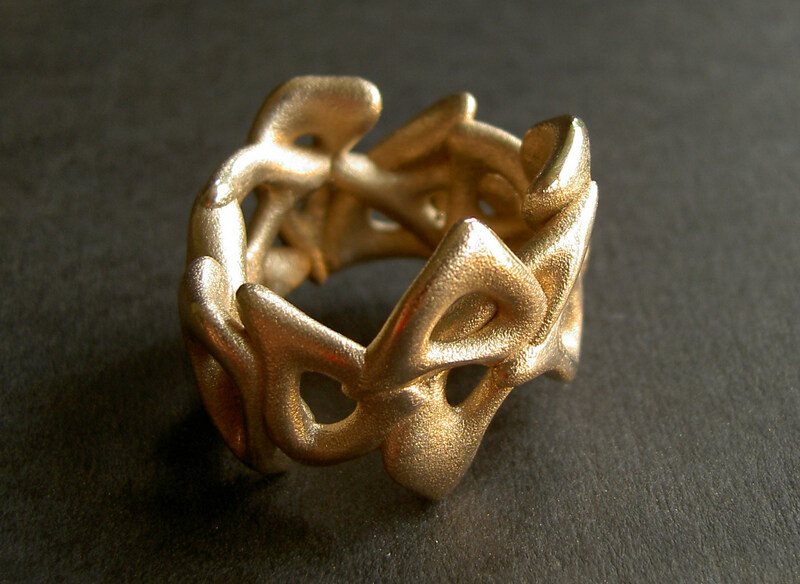 Tower, 3rd April to 7th June, is themed on 3D printed jewellery and has a special section for our ‘3D Consequences’ project to show the 3D printed objects that resulted from the project. The models were designed by Farah Bandookwala, Elizabeth Armour, Lucy Robertson and by me, Ann Marie Shillito, CEO of Anarkik3D. Sculpteo sponsored 3D printing 8 objects in polyamide, ITEC-3D 3D printed 5 in using Mcor’s Matrix machine. Anarkik3D sponsored the printing of a brooch by Elizabeth and 3 rings by me. ITEC3D sponsored a group which is 3D printed in paper on Mcor’s Matrix machine. As I want to understand the process and the constraints imposed by this method of 3D printing I requested that the ‘block’ of 3D printed paper be sent intact so that I could extract the objects. This was quite a challenging task and certainly being a jeweller and having tools such as fine pointed tweezers is an advantage when removing the layers of ‘waste’ paper to reveal the objects within. Although this was very time consuming (and I was being ultra careful) it was such a satisfying and immersive job. For an intricate object it is a long winded process and the actual time it can take to extract the model must make the cost per item high. Lucy’s model 3D printed in paper and partly extracted. I will pull a powerpoint presentation together to show the process of extraction and get it up on SlideShare. Update 16th October 2013: 8 3D printed models arrived from Sculpteo and the results are great. These were on display at the 3DprintShow 7-9th November in London on our stand with our haptic 3D modelling system, Anarkik 3D Design, that Farah, Elizabeth, Lucy and I used to create the digital models which we had swopped around in 3 iterations to produce our 12 objects. Elizabeth and Lucy were on our stand helping to demo our system as haptics (virtual touch) just has to be tried to grasp its significance as a better way of modelling in 3D! 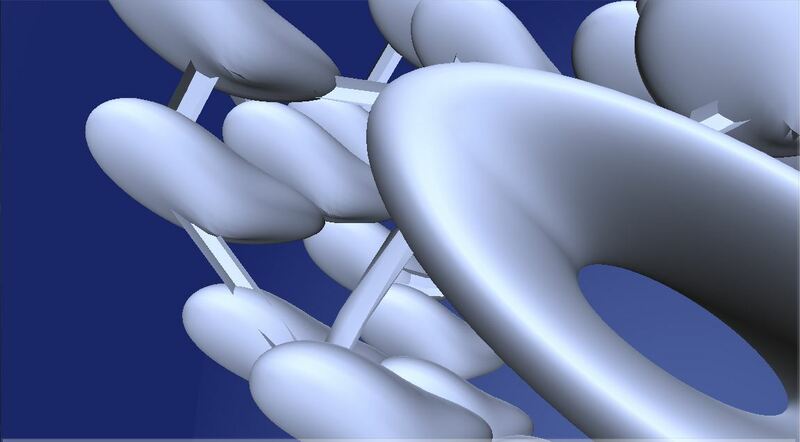 Update September 2013: All the 12 models are now completed and checked for 3D printability. I decided to try out Sculpteo’s interface as I had met and spoken to Nicolas Mathian at their stand at the TCT 2013 trade show in Birmingham. I am very impressed. I have also made contact with ITEC in Bristol who have Mcor‘s 3D printer as we would like one or 2 of Lucy’s pieces 3D printed in paper so that she can experiment using her thermochromic paints and dyes on them. Update 14th August 2013: With Lucy off to India for a 4 week residency, and Elizabeth Armour heading for a residency in Finland we concertina-ed the project into 3 stages, with the first round completed on 6th August and 3 models for the 2nd round completed a few days ago with 1 more to come. Lucy completing her 3rd and final model today before she heads to India. Here is a snapshot of the models and you can see the full range here on Pinterest. 29th July: Lucy Robertson, a textile designer recently graduated from Duncan of Jordanstone College of Art in Dundee has been selected as the 4th person to this project. The reasons she was selected is her obvious enthusiasm for a challenge and for learning 3D modelling for 3D printing. Being in a different discipline to Farah Bandookwala and Elizabeth Armour (both trained as jewellers but work in other areas too) will add another focus and direction, as well as some challenges which she will I hope relish and enjoy tackling! A major requirement is being able to access our Anarkik 3D Design package and Lucy will be coming into our office here in Edinburgh to work where she can also get the support and information to be thoroughly involved and overall participating in making this a very exciting venture for all of us. Update 12th July: Deadline for submissions is 21st July 2013. If you would like to apply to be the 4th designer maker, please email thinks@anarkik3d.co.uk, subject line: ‘3D Consequences’ with a statement about you, why you would like to be involved and a link to your work. stage 1: all four design an object digitally. stage 2: swop models, each working on a different stage 1 model, and again capture progress, save new creation to dropbox, etc. each collaborative design transformation physically captures the stories and imagination behind each iteration. Model for a bead: detail. There is a logistical reason for selecting jewellers: they can work small and these smaller pieces are cost effective to 3D print, and value can also be added to the 3D print which is likely to be a white nylon type material. This collection of work and its case studies will be used to promote the value our product has for designer makers and show the design potential and complexity possible using Anarkik 3D Design and 3D printing. The 4 designers involved in the project will also be promoted through publicity and exhibitions and hope they will reciprocate. With more traction, more projects like this become possible and so on – the snowball effect! 3D printing is hot technology which requires 3D digital models and for creative people creating one’s own is important. Anarkik3D developed their touch enabled 3D modelling software,‘Anarkik 3D Design’, to be affordable, easy and enjoyable to learn and use. It is designed by designer makers for designer makers/applied artists, particularly for those who do not use or like computer aided design (CAD) software and uses an off-the-shelf 3D haptic force feedback device to provide the touch sensation and easy 3D movement for navigating and creating in a 3D environment. If you would like to apply to be the 4th designer maker, please email thinks@anarkik3d.co.uk, subject line: ‘3D Consequences’ by 21st July 2013, with a statement about you, why you would like to be involved and a link to your work. You have to have access to our software and the Falcon haptic device. If you live in or near Edinburgh Anarkik3D offer you the use of a system in their office, plus tutoring and support. It will also be necessary to set aside time to work on 4 pieces and to 4 deadlines and to enjoy collaborating with 3 other people in what will be a fun project. We will use this blog to comment on the project and show progress. Next Post: Crowdfunding: Trials and tribulations of setting up! Looks really interesting, thanks for posting information. Reblogged this on Elizabeth Armour.